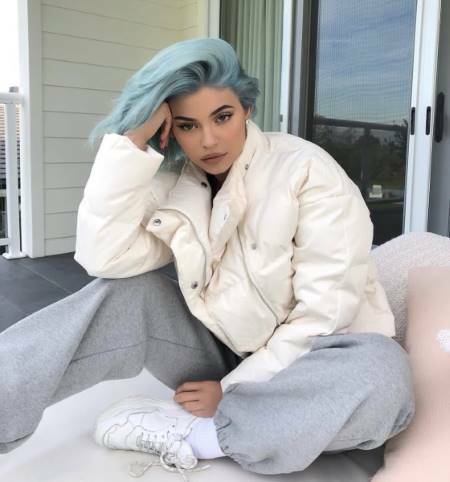 Reality TV star Kylie Jenner looks like a Barbie doll after changing her blonde hair to blue color just for the chilly weather. The richest Kar-Jenner sister aka Kylie Kristen Jenner who's on her way to becoming a billionaire soon prefers doing a lot of things for fun. And one of her hobbies she prefers doing fo fun includes, of course, constantly dying her hair different colors. As a matter of fact, the Keeping Up With The Kardashian's star has once again transformed her hair color. It's not strange seeing some celebrities change their hair colors for occasions and trends. And Kylie definitely falls under the same category as well. In an interview, other than changing her hair color for fun, the 21 years old TV star and model revealed that she changes her hair colors to make her feel like a new person. But, this time, Jenner who previously rocked blonde hair decides to dye her hair blue for the changing and new chilly weather. And with no doubt, its safe to say she is rocking her new blue hair too. The owner of Kylie Cosmetic posted a new photo on her Instagram showing off her new blue hair to her 122 million followers. Furthermore, in less than just seven hours, the picture earned more than 4 million likes. Kylie resembling like a Barbie doll in the snap poses with her head laying on her hand. Prior to matching and dominating her new blue hair, she cleverly wears a white jacket and a grey sweatshirt making her look extra stunning. And to be honest, we totally can't stop fangirling over her new seasonal look. In addition to her hair color transformation, Jenner whose hair is naturally black which also appear dark brown previously went from dying her hair orange to red to neon yellow to purple to pink.